Several things happened with the recent event in Charlottesville Virginia where we're told that a 32 year old woman was killed and many others were injured when a driver, 20 year old James Alex Fields drove his car into a crowd of protesters. We've all seen the story and the controversies surrounding it repeated on both mainstream and alternative media for day. It's been several days and we can now step back and appreciate the lessons learned in this event, which upon closer inspection reveals shocking truths that everyone in America needs to recognize as soon as possible because the future of our nation depends on this. To understand the importance and significance of this event look no further than the players themselves. By that I mean not just the villains that the mainstream media and Hollywood celebrities unanimously parroted to no end to remind you of - that being the White Supremacists, "Nazis" and KKK members who decided to jump into the 'Unite the Right' protest event scheduled that day- but also the villains on the other side of the fight who got a complete pass from the media and Hollywood as if they did no wrong- that being "Antifa", the supposedly "anti fascist" good guys who (contrary to video evidence) the mainstream media and their Hollywood talking heads would have you believe are a peaceful pro-America group that means well. Nothing of course, could be further from the truth. A close inspection of the radical White Supremacists movement in the U.S. reveals that although it exists, Nazism and White Nationalism is now and for the most part always has been a fringe movement here in the U.S.. Generally speaking most Americans reject Nazism and White Supremacy groups. Their speech is not the typical thing you'll run into on TV, in the movies, the local newspaper or even your local church. They associate with hate and violence and there is no need to convince Americans of this since Americans are generally in unison about how they feel about these groups. A close look at the Antifa movement however, their history, their background, their stated goals and intentions, and how they go about their agenda reveals a different story from the innocent picture the mainstream media is painting of Antifa. So before we pull the cover from the Antifa "wolf in sheep's clothing" operation and reveal the story behind Antifa let's first consider the two main political agendas behind the recent Charlottesville event as I see it. 1- The event was used to try to associate President Trump and his supporters with "Nazism" and "fascism". Because the direct connection is almost impossible, instead the deep state and their mainstream media went for the "Nazi = alt right = Trump supporters" strategy. In this example one can see that the term "alt-right", which was created and introduced by Hillary Clinton herself, now serves as the perfect propaganda term that bridges the two groups which the liberal left is trying to associate, that being "Nazis" and "Trump". This weaponization of the term "alt-Right" seems to have been accomplished very nicely. 2- The other important purpose of the Charlottesville event was to quietly condone, legitimize and perhaps introduce at a national scale the actions of a group unheard of to most Americans until now- "Antifa". 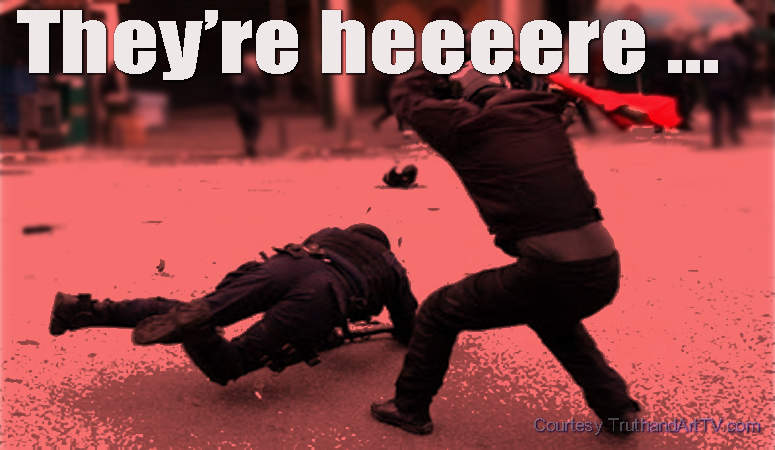 Like it or not, they're here and this event has served arguably as the symbolic grand entrance of Antifa onto the streets of America and thus the consciousness of Americans. And before we join the Hollywood celebrity and mainstream media propagandists in celebrating the arrival of Antifa let's take a close look at the history and true identity of Antifa. A nice summary of the history of Antifa is provided by Grunt Works Media leaving no doubt as to who Antifa is and what their ultimate purpose is. Antifa, or Anti Fascists, are making headlines around the country ... particularly in Berkley, Portland, and other far left strongholds. They are initiating violent protests, counter protests and rioting on college campuses and in the streets of major U.S. cities. For many Americans they appear to be a new organization, one which has sprung to life to protest President Trump’s election. In reality Antifa is nearly 100 years old and has roots that go directly back to Joseph Stalin and post WWI Europe. What is new about the current Antifa movement is their target. They are no longer attacking fascists to springboard a communist revolution in Europe. Their current target is the political rift between Conservatives and Liberals in the U.S. Their goal is to create the conditions for a Communist takeover of the Democrat party and the eventual subversion of our constitutional republic. To this end they are attacking everyone who holds a conservative viewpoint-and for political cover, they are labeling conservatives as fascists while obfuscating their own communist ideology. Antifa and the communist party hope that Americans will focus on the message of anti fascism. They want us to forget that communists have slaughtered far more innocent lives than the Nazis did, and that while fascism has become a worldwide pariah, communism has continued to be a major player in politics around the world. Communism remains a clear and present danger to liberal democracies everywhere. Fascism first reared its ugly head in Europe during the post WWI era, when communism had already made great inroads in Eastern Europe. Spurred by the industrialized violence of the Great War, many Europeans sought a strong central government which they believed could protect them in the event of another war. In the confusion and turmoil following the collapse of Germany and the subsequent great depression, the far right looked to fascism, and the far left to communism. Both of these political groups saw liberal democracies as weak and obsolete systems, and favored a strong central government run by a committee (communism) or by a dictator (fascism), either of which would be backed by party loyalists. From 1918 to the mid 1920s several groups of German communists, backed by Stalinists in Russia, made a series of violent attempts to overthrow the newly formed Weimar Republic government of Germany. These attacks were unsuccessful in large part due to lack of central leadership from the communists. After some initial infighting, the major communist group to emerge was the Kommunistische Partei Deutschlands or KPD. The KPD’s main political target going forward would be the fascists, and the paramilitary arm of this anti fascist movement would be Antifaschistische Aktion. During this period in Germany the KPD would garner a respectable 10% of the national vote, making it the strongest European communist enclave outside of Russia. Strong anti-communist feelings in the leadership of the Weimar Republic were bolstered by these unsuccessful coupes. Concern over these insurrections led to a national call to action to fight against communism. Under the leadership of Gustav Noske, the German defense minister, the Freikorps were formed. These freikorps were government sanctioned paramilitary groups primarily made up of disaffected WWI veterans that used direct action to suppress communists. Freikorps were quickly subverted by the fascists, leading eventually to the brown shirt militias and a Nazi takeover of Germany. Antifaschistische Aktion and the KPD sank into obscurity during WWII as the Nazis crushed any opposition with an iron fist. During the Cold War the KPD regained some of its former glory in East Germany as well as enclaves in West Germany, but with the primary enemy of communism now seen as the West-capitalism and liberal democracies-there was little reason to utilize the anti fascists, and they were quietly relegated to the role of occasional anarchists on behalf of the communists. They stayed under the radar until the 2016 U.S. presidential election where, very quickly, Antifaschistische Aktion was resurrected as Antifa. As you can see, when we pull the veil from the "Antifa" operation they are a Joseph Stalin backed militant Communist organization originating in Germany and a group which was unheard of for the most part until the Liberal Left unleashed them on America as an anti-Trump militant color revolution group posing as Anarchists against "fascism". Other Antifa related sites talk about bringing in more Antifa terrorists from Europe and doing anything necessary to "fight a resurgent far right in the Trump era". There is nothing in the history of Antifa to make anyone in America believe that they love and respect America, the Constitution and the Bill of Rights. All they do is create the needed domestic and national turmoil by stirring up anger based on victimhood. This anger is then harnessed as a weapon to overthrow elected governments around the world. This is a classic example of the Communist "National Liberation" agenda to overthrow nation states as G Edward Griffin explains in this video. The problem with Antifa's existence in the United States is that there is no Fascist party in power in America and neither has there ever been. That leaves Antifa in the boxing ring without an opponent. Enter Hillary Clinton and the presidential election race. Now we can understand why Hillary made her campaign seem more like a political uprising than anything else. During the campaign season I kept wondering to myself, why is Hillary saying what she is saying? I kept wondering, why instead of addressing the actual issues that people tend to vote on, instead Hillary focused her entire campaign on demonizing Donald Trump and painting him out to be Hitler and a hater. I kept asking myself, where was this going? Looking at events in America 7 months deep into the Trump administration we can now clearly see what the plan was. They were setting the stage for radical militant Communist groups like Antifa and they were creating the impetus for the revolution they would soon wage against the Right and against Trump. Problem Reaction Solution. Hillary was creating the problem (Trump is a Fascist) for which the Soros funded "solution" ("anti-fascist revolutionaries) would be rolled out. This is not speculation as shocking videos revealed by Project Veritas showed radical Left wing pro-Hillary activists planning to provoke violence at Trump rallies. Wikileaks emails revealed the mainstream media and the DNC colluding with the Hillary campaign to make sure she wins the election. Revolution against Trump and the planned overthrow of his presidency seems to have been plan B all along in case Hillary loses and now it is in full effect. A few months ago I documented how proxy armies were coming to America to disrupt this country the same way that the CIA and Soros have undermined and overthrown governments around the world for decades. I mentioned back then when I discovered a mainstream media article for the first time portraying the militia in positive light. It became clear to me then that this was very likely something we would be seeing here in America. More civilian resistance against the government. Obama even promised in his 2008 campaign an army of civilians "just as powerful" as our military. Think about that. He was hinting back then of what was going to happen. And with the arrival of Antifa onto the national scene it is a good time to remind readers that they are spreading rapidly all over the country. That's right. An army of civilians nationwide with a Communist history and who spread Communist ideologies under the banner of fighting victimhood dating back to Germany in the 1920s is growing in America. They're encouraging Americans to join and if you want to know what their conditions and mission statements are check out their website and see for yourself. Warning, you won't see any mention of America, the Constitution, freedom, the Bill of Rights or the rule of law on their site and that is because none of these things line up with the Communist agenda. They especially despise the first amendment and free speech and collectively they are a weapon against free speech in America. If the purpose of your group is to do public organizing where your members are clearly identifiable-organizing anti-Trump rallies or supporting refugees and immigrants-using the antifa label and the traditional antifa symbols will likely lead to blowback that could be avoided by naming your organization differently. “Las Cruces United Against Racism” will not draw the attention that calling yourself “La Cruces Antifa,” and using traditional antifa symbolism, will. ..if AltRight speakers come to town, or if the Daily Stormer holds a meet up, you will be expected to organize a counter-demonstration. If they hold postering or sticker campaigns, you should not only take down their materials but also put up your own; public outreach campaigns should likewise be countered. Build a culture of non-cooperation with law enforcement. If you have any intention of working with the police, FBI, or other agencies; or if you publically condemn anti-fascists who break the law: don’t call yourself an anti-fascist. The cops will be Trump supporters; do not collaborate with them. Antifa is deceptively classified by mainstream media as "Anarchists". They do this because most Americans especially the average working class are less likely to be alarmed if they hear "Anarchists" as opposed to "militant radical Communists" which is what Antifa really is and is originally based on. On their site as you can see, they admit that aside from fighting "fascism" their mission involves resisting President Donald Trump even though Trump has nothing to do with "fascism". They are even, get this, sworn enemies of the police across the board. When did the concept of local police across the board become equivalent to "fascism"? And why are they more concerned with bringing in immigrants than protecting, honoring and building the country itself, the Constitution, free speech and freedom? Everyone should be asking these questions. Ultimately the price of not asking these basic questions will be the final destruction of America, freedom, the first amendment, the Constitution and the rule of law. And who will benefit from this mass destruction you might ask? The deep state, the ruling elite, Hillary herself, Obama, and the globalists who want to get their new world global order done. That's who. They are temporarily using the Antifa "anti-fascism" label to undermined Trump, silence opposing opinions, silence Conservatives, Republicans and anyone on the Right who supports Trump by labeling them all as first "alt-Right" which they are suggesting really means "fascists". They hope that enough Americans are naive enough to fall for this suddenly resuscitated 1920-style (literally) Communist propaganda because all of Hollywood and the mainstream media are telling them to. So the final question is, are there enough dumbed-down and brainwashed Americans (who believe mainstream media and Hollywood) to overthrow Trump and overturn the results of our elections which would almost certainly lead to civil war and blood on the streets of America? I hope not but with every day that goes by I'm increasingly worried that this is possible. I am choosing to remain positive for now. 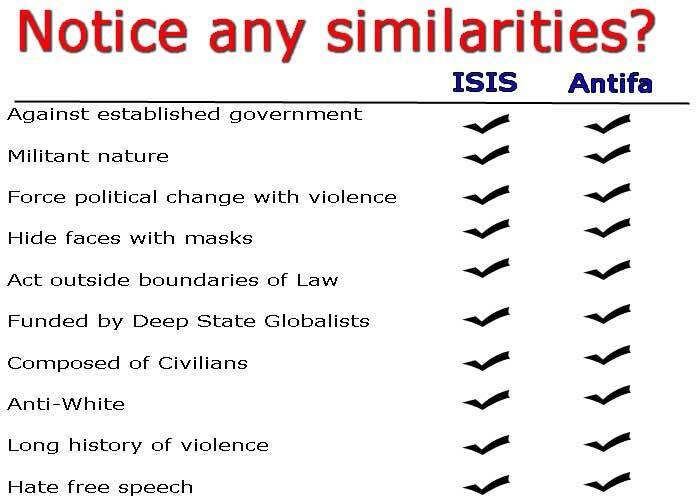 I believe that Antifa, as we saw with ISIS in 2014 will eventually be fully exposed for who they really are, where they come from and what their ultimate purpose is here in our streets of America. Unfortunately, it is very likely that the deep state is aware that this tactic may fail and thus very likely this is just one plan among many that they are implementing in their attempted overthrow of Trump. Therefore let us first be aware that this is but one segment of a long process and for now let us not allow this one to succeed. If you agree please share this urgent message.